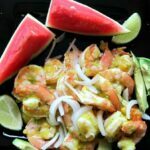 Avocado Shrimp Salad with Mango Dressing, a Jamaican roadside stand inspired dish with sweet shrimp simmered in a peppery broth. This is just flat-out moan and groan, roll your eyes delicious. 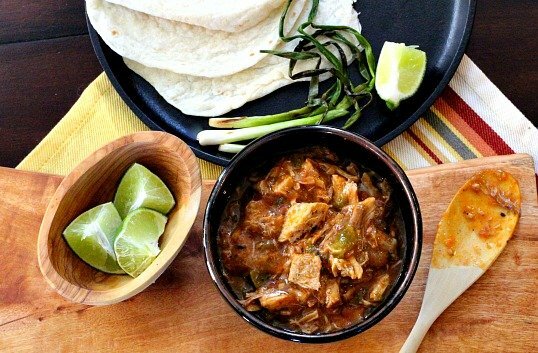 I found this recipe last summer over at Food and Wine, wrote rave reviews in my database and can’t believe I didn’t blog it back then. This is a crowd-pleaser that could be served as a first course if placed on a bed of greens. Or as your main course when served with a wedge of watermelon and a side of rosemary flatbread like we did Saturday night. Pair it with your favorite frosty glass of Sauvignon Blanc and you’re in heavenly business. But first let’s take a look at my flatbread. 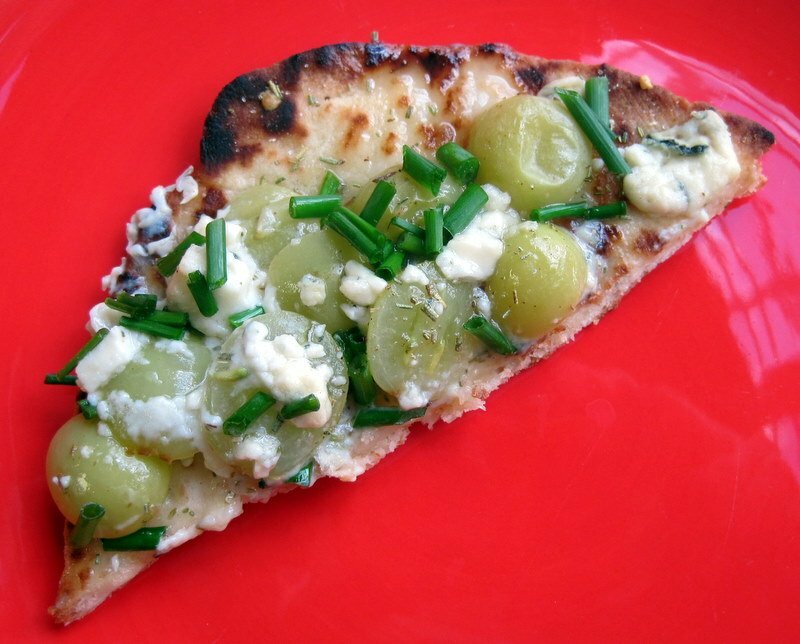 The Bread: I bought a package of Naan, sprinkled on some fresh chopped rosemary, covered with halved grapes then topped with crumbled blue cheese. A few minutes in the oven until warm and toasty and the cheese just starting to melt, sprinkle on some fresh chopped chives from the garden..it made a great side for the shrimp. Red grapes would have been better, but the market had none. The Wine: We paired this with a wonderful glass (or two) of Merry Edwards 2007 Sauvignon Blanc. The highest rated wine ever to come out of California, we decided to order a couple of bottles directly from the winery. Here’s their tasting notes: This compelling blend allures the senses with hints of citrus blossoms, lychee fruit and mango. Soft honey weaves its way through the sumptuous palate. Time in the cellar will allow even more richness and complexity to unfold. 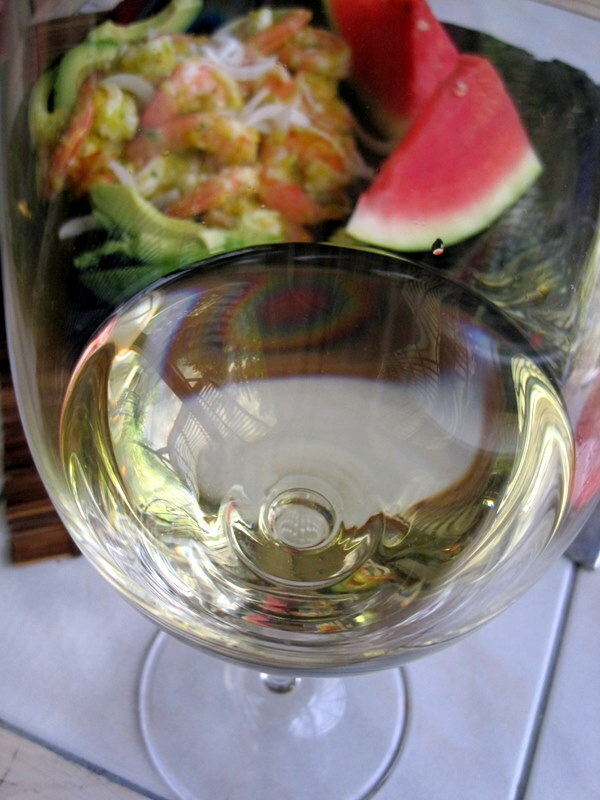 Pair this delightful wine with elegant raw oysters, a salad of blood oranges with yellow and red baby beets or giant prawns in Thai green curry sauce over rice noodles. I mean c’mon, who can resist that lovely description. The Salad: Fresh and delicious, I urge you to take the time to give this a try. The Mango dressing is easy to whip up with the hardest part being dragging the food processor out of the cabinet. And shrimp is so easy. I really can think of no excuses not to enjoy this Summery offering. Prepare the shrimp: Squeeze the lemon halves into a large saucepan then add them to the pan. Add the water, onion, salt, Scotch bonnet, ginger and beer and bring to a boil. Cover and simmer for 15 minutes. Add the shrimp and cook for 3 minutes, just until pink. Drain the shrimp and spread on a platter. Refrigerate until chilled. Halve the shrimp horizontally. Meanwhile, make the dressing: In a food processor, combine 1/3 cup of the diced mango with the vinegar, lime juice and mustard and puree until smooth. With the machine on, add the oil in a thin stream and blend until very smooth. Add the cilantro, lime zest and minced Scotch bonnet and pulse just to combine. Transfer the dressing to a large bowl. Add the shrimp, red onion and the remaining mango and season with salt and pepper. Toss to coat. Arrange the avocado slices around a large platter. 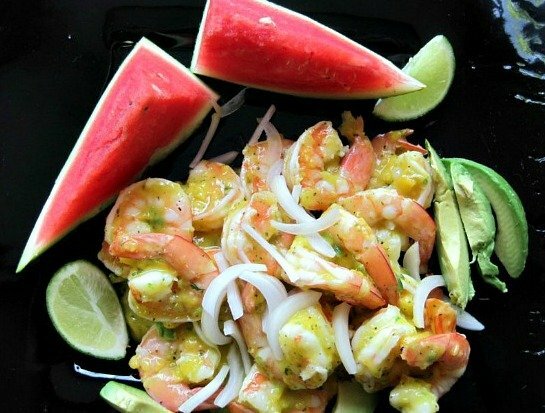 Mound the shrimp salad in the center and garnish with lime wedges. Serve right away. Since I’m on my best behavior today, I’ll let the “moan and groan, roll your eyes” line slip by :-), then say it does look and sound that good and we’ll give it a try soon – I think we have everything on hand but avocado. Great photos as well. Everything sounded good, except my dislike of avocados! I won’t put any avocados on your plate then! Finding good shrimp is a must. Make sure you find some big ones! Lea Ann, these pictures scream “It’s SUMMER!” 🙂 Great salad! You have a seriously winning meal on your hands here! I love all the components, but you know i”m partial to that flatbread. I love anything with blue cheese. If it’s what for whatever, when do I get invited? Have to share…just finished a new blog for St Supery…know you love them, too and I just might be getting a little ‘bonus’ shipment. Be nice and bring food; I’ll have wine! 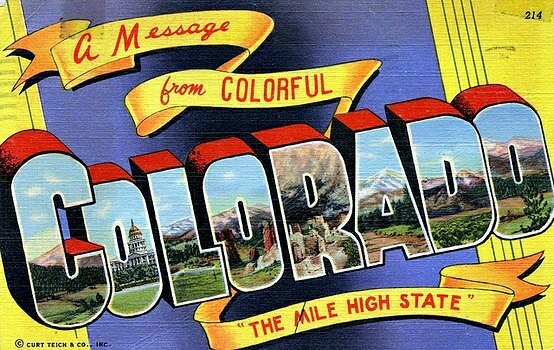 Take a peek – http://www.stsupery.com/blog – we should do a dinner with their wine and see if we can guest post. Huh? Huh? Love the Supery blog. That chicken sounds wonderful and I also saw a crab cake thing that I’ve got to make – NOW. Let me know about the dinner and wine idea. This looks amazing! You should have come here and made it for my birthday. 😉 But since you didn’t, I’ve passed it on to Neal and friends – between them someone will make it surely! Pictures are wonderful. thanks! This is making me hungry again. That is one tasty meal! I have yet to try habanero. I think I need lots of water on standby…. I don’t think I’ve tried cooking with them, but somehow I know they’re really hot! Maybe a dash of habanero sauce at one point? I love shrimps, especially grilled shrimps and shrimps in salad. This recipe of yours is downright refreshing! Very appealing to the eyes! I love the sound of mango dressing on shrimps. Thanks for sharing this one, I will try this for sure. Actually, I’m itching to try it now, but I don’t have fresh shrimps available. Probably tomorrow, I’ll visit the market early, lol! Gosh, I love what you did with the naan, Lea Ann. Going to try that ASAP. Now on to this delightful shrimp dish! It’s a marvelous dressing. And the photo of your dish through the wine glass is very artistic. Super impressive meal! The colours of this just scream SUMMER. Such a great looking dish and looks packed full of flavour….. YUM is the only word to desrcibe this. The salad looks insanely delicious! What a beautiful array of flavors! The naan sounds like something special too. Wow! Everything looks incredible. I don’t know which I want to try first. Love the shot through the wine glass…so creative! Thanks Pam! As always, thanks for stopping by and the comment. I am fascinated by this mango dressing; can’t wait t try it and serve it with something, this salad for instance or just about anything else! I can’t think of a more perfect dressing for the summer! Thanks Joumana, I really liked it, hope you do too. Yep, that’ll work. That looks absolutely amazing! I love summer dishes like this. that looks positively delicious!! what a great combination of flavours you have going there!! I love the mango dressing!! Thank you! I’ve only made it twice but it’s one of my favorites.